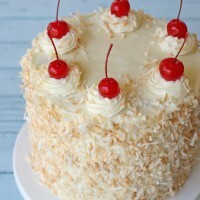 As I plan desserts for the annual Luau party my family attends (and I make special desserts for) I like to add something a little different each year. There are a few favorites I tend to stick with, such as my Hibiscus Flower Cookies (as shown above), but I like to mix in new ideas as well. This year I tried a new design, a wet-on-wet tropical motif on a simple round cookie. 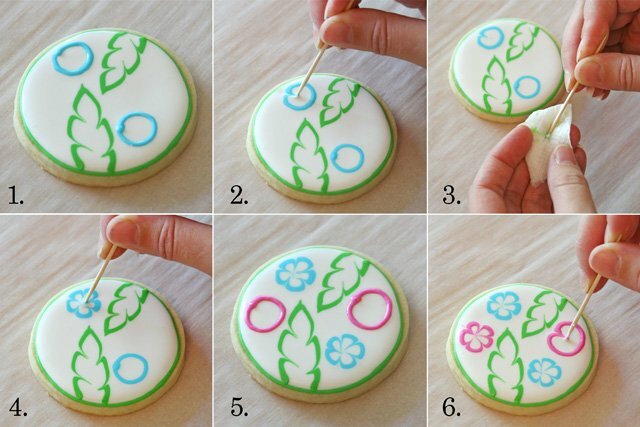 Although the design is a bit time consuming, each step it is quite simple to do, and perfectly appropriate for beginner cookie artists. First, you’ll need a batch of cookies made with my Sugar Cookie Recipe (or your favorite). Then, prepare a batch of Royal Icing. For this design, you can prepare just one bag (or bottle) of each color, mixing it to a medium consistency (when mixing the icing, draw a line through your bowl of icing with a spoon, and the line should heal, or disappear in 12-15 seconds). 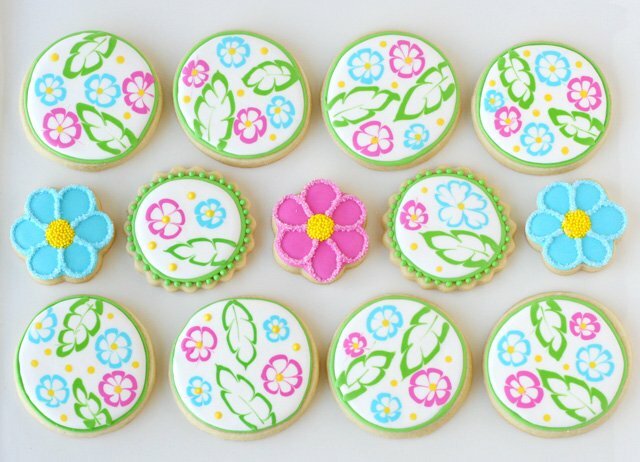 This cookie design uses a decorating technique called “wet on wet”, meaning the details are added while the base icing is still wet. Each step of this cookie design should be done back to back, as quickly as possible (with the exception of allowing the green outline of the circle a little time to dry). 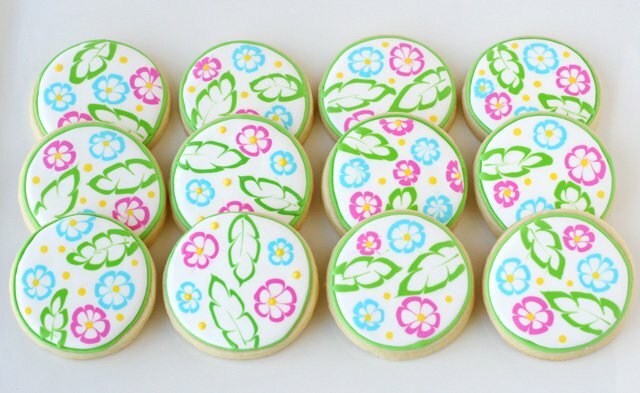 Complete the full design on one cookie at a time, before moving to the next cookie. 1. 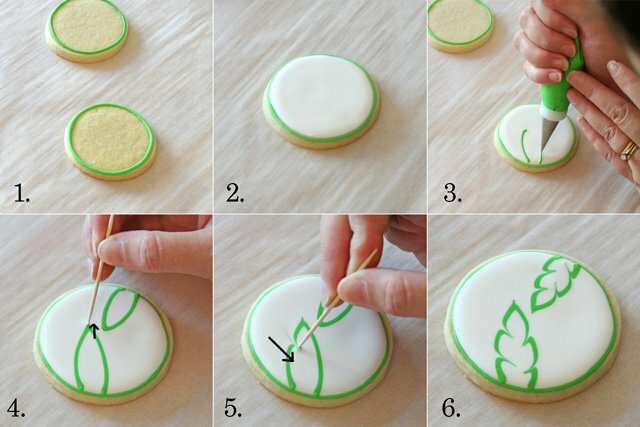 Outline your cookie with green icing and allow the icing to set up (at least 30 minutes). 2. Fill in with white icing. 3. Immediately, add simple leaves (as shown). 4. Use a toothpick to create a point at the tip of the leaf, by dragging the toothpick from the inside of the leaf, toward the outside (as shown). 5. Now, add shape to the leaf by dragging the toothpick from the outside edge, toward the inside of the leaf, along both sides (as shown). 1. Pipe two circles of blue icing (as shown). 2. Immediately use a toothpick to create flower petals, but dragging the toothpick from the outside edge of a circle, toward the center. 3. Throughout this cookie design, use a small moist cloth or paper towel to wipe off your toothpick between each “drag” on the cookie. 4. Continue around each circle, dragging the toothpick from the outside edge toward the center. 5.-6. Add pink (or a color of your choice) circles, and repeat steps 2-4 above. 1.-2. As a final touch (immediately after the previous steps, and while the icing is all still wet), add yellow dots of icing in the center of each flower, and a few random “filler” dots as well. 3. The finished cookies. One step I didn’t photograph is adding the little green “vein” detail in the center of the leaf (you’ll notice it in the cookie on the left, in box #3). For this detail, as soon as you have made the leaves, dip your toothpick into an area of the leaf with green icing (to get a little green icing on your toothpick). Then drag your toothpick up the center of the leaf, from the base, to about 2/3 up the leaf. In addition to the tropical flower and leaf design, I made several hibiscus flower cookies (as shown in the photo at the top of this post), and also a bunch of little accent flower cookies. The little flowers were simply outlined and filled in, then I added a pre-made flower center, using Sweet Sugar Belle’s awesome technique! Once the base icing was dry (several hours), I outlined the petal shapes with matching icing, and then immediately sprinkled the whole cookie with white sanding sugar. Shake off (or brush off with a clean, small paintbrush), any excess sugar (onto a paper plate). Que galletas mas monas! Explicas el paso a paso genial! I love the leaf effect…it’s perfect! So pretty. Beautiful work on wet on wet technique. Love the leaves! those are so pretty and they look really complicated too, but I so want to try . Beautiful! Love the wet-on-wet. And keep the luau treats coming…I’m not ready for fall yet! What a gorgeous set Glory! I am in love with every design. I love the new design with the hibiscus flowers! Perfect!!! I can’t wait to see the next two luau posts!! Wow, the cookies look so amazing…they look like one of those transfer cookies…so pretty, Glory! WOW. 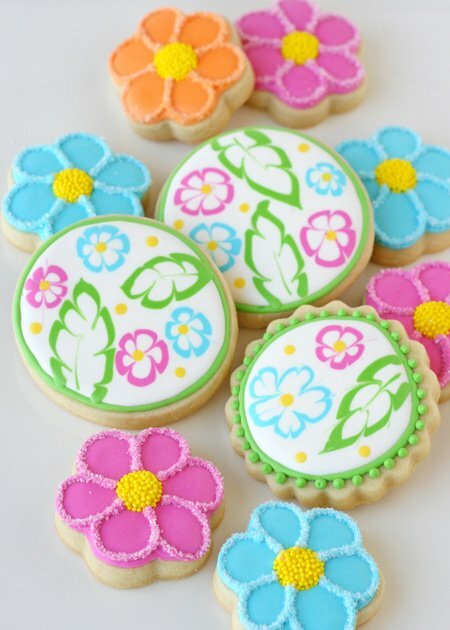 Attractive, lovely cookies with amazing decoration. So beautiful. Glory – these are soo pretty! I just love the beautiful smooth look of the wet on wet cookies. The colors are some of my favorites! 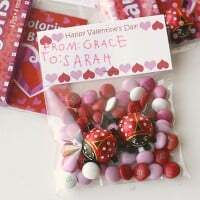 Those are super cute and I love how easy it looks to create the designs. Thanks for all the links, you are efficient. Love you! I just love these. They are screaming to be turned into a shirt!!! Honestly..these are so beautiful. 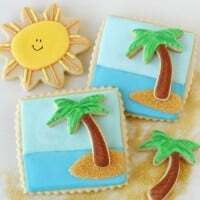 I’m not even close to being tired of your luau cookies. My hubby and I went to Hawaii last summer and these just remind me of how wonderful it was! The tutorial makes me think I could make them too! The colors are amazing. Your cookies are amazing! Such talent lady! I could gaze at these incredible pieces of art for hours! I forget these are actual edible cookies… Again, such a detailed and helpful tutorial – thank you. Just the thing for our imminent Australian summer! Hi..Your cookies are just out of this world ! The finish is superb not to forget d designs…they r so bright n beautiful !! I would like to know if u have a recipe for eggless royal icing ?? Please share if u do have one.Also the your colors come out so bright..what kind of colors do u use ?? Hi Punam, I do not have a eggless royal icing recipe, but I would suggest a google search, and you may be able to find something that would work. For coloring, I use Americolor brand gels. They are concentrated coloring, and are very easy to use. 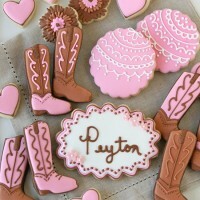 They look amazing, just wondering how many cookies you could be decorating at one time? Ie, two at a time, going between the two? I would like to make 10 each of these, the hibiscus and the pineapple cookies, as well as your flower design on a baby onsie cookie. For this “wet on wet” design I would suggest only working on one cookie at a time. 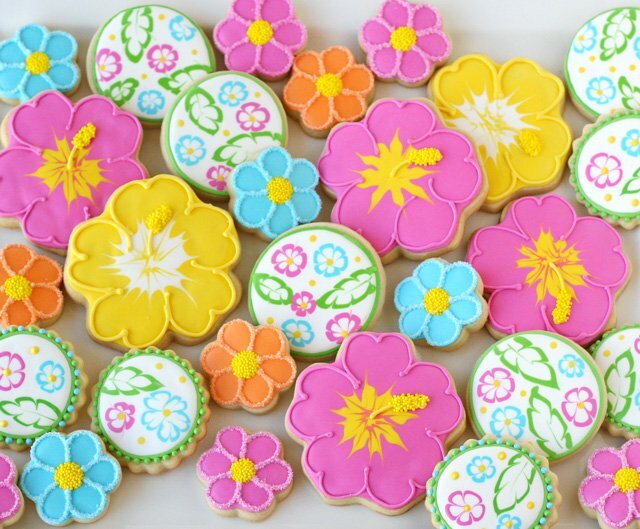 The icing will start to dry shortly after you flood the cookie, and for this design you want the flowers and leaves to sink into the wet icing, not sit on top.